Now I know what you’re thinking. Strawberries? You posted a strawberry recipe in January, when the strawberries aren’t easy to find, are imported from Egypt when you do find them and cost £2 for a punnet of barely 10 strawberries? Yup, I sure did. 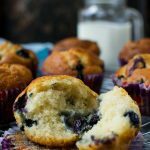 Because today I decided to pull out all the stops, throw caution to the wind and post a happy, summery, party recipe worthy of celebrating the arrival of two very special babies during this last week. Let me elaborate – not only did my sister give birth to my beautiful niece just a few days ago (very excited about that, needless to say!) but my wonderful friend Meggan of the food blog Culinary Hill has also just announced the arrival of her gorgeous daughter. So, what better excuse to combine three of my (anyone’s?) favourite foods aka strawberries, cake … oh, and chocolate, of course! Now I’m no expert on baby shower food, but it seems to me that a combination of these three ingredients would be happily gobbled up by any mother-to-be/new mother and her friends … am I right or am I right? Let’s all pretend it’s summer! 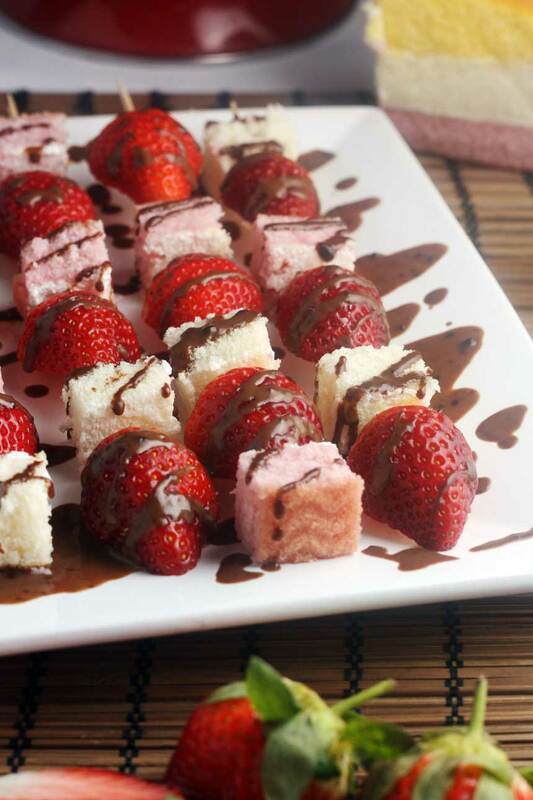 Of course, this is more of an idea than a recipe really, as all it entails is threading half-strawberries and cubes of pink and white angel cake onto skewers, presenting them nicely on a plate and then drizzling them with a quick and easy warm chocolate sauce. 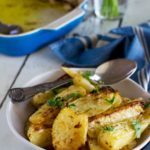 But hopefully you’ll agree that although you can throw these together in minutes, the result is as pretty and mouth-wateringly tasty as something you’d spend hours on. 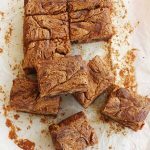 To be honest, these are so easy to make that it isn’t necessary to say too much more about them – just that I chose to cut my strawberries in half before threading them onto the skewers and cut my cake into squares that roughly matched the width of the fruit. Also, my cake squares were simply cut from a store-bought cake called ‘Angel layer cake’ here in the UK (available from the big supermarkets – got mine from Tesco’s!) I chose this because it had pink and white layers that I could cut pretty cubes from, but if you can’t find the exact same thing where you live, I’m pretty sure you could find something similar … or even make your own cake to use if you prefer. A simple Angel Food cake or Madeira cake would be fine. As for the chocolate sauce, well, this is simply a mix of melted dark chocolate, butter, a tiny bit of sugar and cream. I spooned a little into a piping bag to drizzle over the plate of skewers and then poured the rest of the sauce into a bowl for easy dipping! Thank you so much for reading this far and helping us to celebrate with Meggan! I really hope you like the strawberry and angel cake skewers (not forgetting the chocolate dipping sauce – mmmm!) and hope that you’ll live dangerously with me this January and eat something deliciously inappropriate like this. Unless of course you live in Australia, in which case … LUCKY YOU and you can stuff yourself to your heart’s content with these and other summer treats! Nope, not jealous at all. (< barefaced lie). Juicy strawberries and pretty cubes of pink and white angel cake threaded onto skewers and served with warm chocolate dipping sauce. 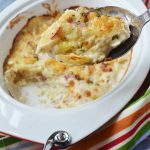 You'll be everyone's best friend if you serve this at your next party - and especially at your next baby shower. 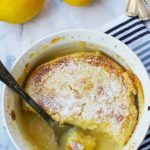 This is a wonderful summery dessert, but, I'm sure, will be well received at any time of year! 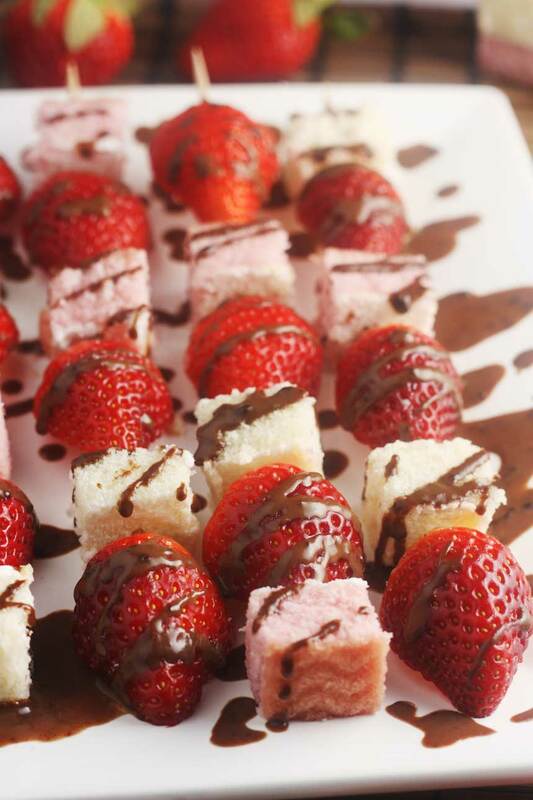 Thread the half-strawberries and cake cubes onto the skewers alternately. Arrange on a plate. To make the sauce, melt the chocolate in 30-second intervals in a medium bowl in the microwave or over a simmering pan of water. Meanwhile, combine the butter, cream and sugar in a small pan and heat until well combined. Pour the cream and butter mixture over the chocolate and whisk until smooth. Drizzle a little of the chocolate sauce over the skewers (I used a disposable piping bag), then serve with the rest of the sauce in a bowl on the side for dipping. Simple chocolate sauce recipe barely adapted from BBC Good Food. I used a cake called an ‘Angel Layer Cake’ which can be picked up at supermarkets here in the UK (I went to Tesco's!) If you aren’t in the UK, just use any kind of pre-made pink and white cake (angel cake or madeira cake, for example). It’s up to you how many skewers you make, of course, but the sauce is enough for roughly 5. Simply double or triple the ingredients for the chocolate sauce to make more. I hope you enjoyed this post! You can subscribe to receive posts directly to your inbox (for free, of course!) by entering your email address into the box at the top of the sidebar on the right. These look great Helen! Great for Meggan’s baby shower! Thanks so much, Mira – happy you like them! I love seeing summery fruit in the winter, I think it cheers people up. 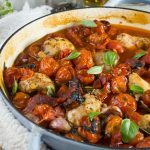 I love this recipe idea, I’ll be trying this soon. Hi Helen, love these sweet skewers and the chocolate dipping sauce. How thoughtful of you all to get together for this virtual shower. Being well versed in throwing baby (and bridal) showers (with more to come, undoubtedly), this is perfect shower food. Congrats Auntie Helen! Thank you so much, Chrissy! It’s very exciting and glad you like the skewers! What a beautiful way to celebrate not one, but two babies! Perfect, irresistible shower food! I know, aren’t they pretty? I just couldn’t resist, even though it’s totally the wrong season! Congratulations to you too! It must be so exciting to have a brand-new little niece! 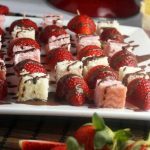 These are perfect for a baby showers and strawberries are one of my favorite fruits, so these skewers are totally calling my name! Oh, I love strawberries, too – especially dipped in chocolate! Glad you like them, Kathleen! CONGRATS on becoming a new aunt!!!! You won me over with “chocolate dipping sauce”!!! These skewers are gorgeous – it’s been so long since I had Madeira cake – thanks for jogging my memory, Helen! Thank you so much for the contrats, Shashi … we are very happy, as you can imagine! Glad you like the skewers, too. The chocolate sauce is definitely what makes them! Congratulations Helen! These skewers look wonderful and perfect for baby shower! Love the nice texture of the cake and strawberries! Thank you, Maggie! I couldn’t resist how pretty these are – winter or not! I am ABSOLUTELY in love with this idea Helen!!! Luckily we get strawberries only in the winter (which is not really winter here in Mumbai at 25 degrees C) LOL! But then I can make these beautiful skewers! We do get this cake in stores so it’s a double yay! Loving the chocolate dipping sauce!!!! I could eat it by the spoonful. Well, I’ll let you into a little secret, Samina … I actually DID eat quite a bit of the sauce with a big spoon. Ooops! Where did the January good intentions go? These would be the perfect dessert to serve at a party. great idea! This seems like a perfect baby shower app!! I love your idea to string the ingredients on skewers, so pretty! Thank you so much, Marissa! I thought any new mother would appreciate this, if only to look at! Hi Gingi … so glad you like these and I hope you give them a go some time! Aww so much to celebrate!! 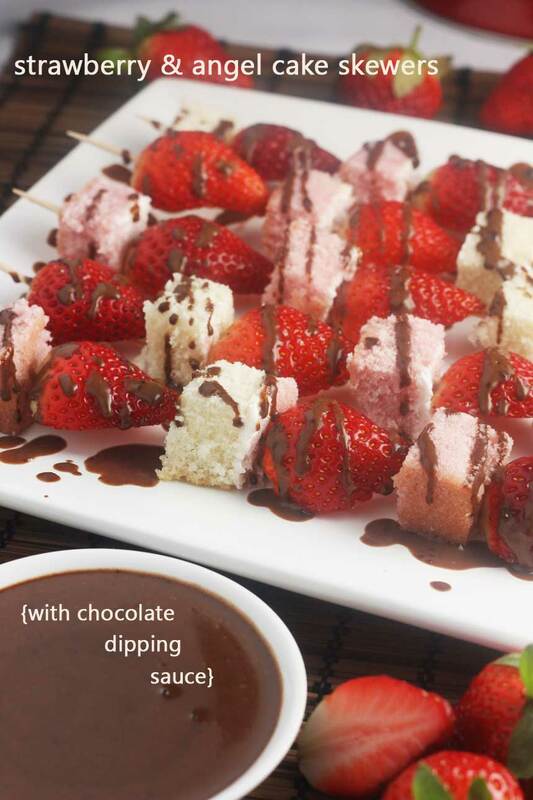 And these skewers do sound pretty perfect for doing so, imported strawberries and all! Yup, who cares about a few imported strawberries once in a while? Glad you like these, Joanne! Those are some gorgeous angel food cake skewers, Helen! So perfect for any kind of shower, especially my virtual baby shower. 🙂 I really loved the pink squares of cake! 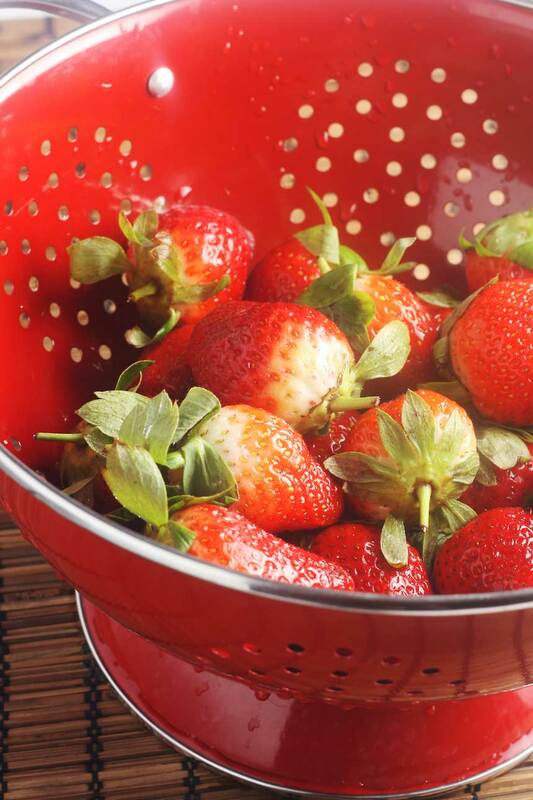 Oh and the gorgeous strawberries (crushing on your red colander!). And who doesn’t love warm chocolate sauce? And like you said, it’s really so easy to make so then we can all spend more time eating. 🙂 Thank you so much for helping to host my virtual baby shower. I was really surprised by it. You are a lovely bunch of gals! XXO Congrats to your sister also! Yippee! I knew someone would appreciate them. They’d be great for Australia day, I reckon! Helen, I absolutely love these! Baby shower or Valentine’s, they are stunning. So pretty. 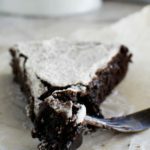 Should make these for Valentine’s Day and honestly, angel food cake isn’t that bad for you, either is chocolate in small doses….or at least that’s what I keep telling myself! The presentation is quite lovely. 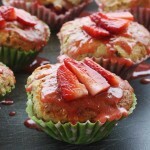 And strawberries here (fingers crossed) have been pretty reasonable and in decent quality, thanks for sharing! Oh no, Helen! Why are you doing this to me? That´s such an amazing idea. I loved it! Congratulations to your friend, expecting a baby is a bless. Thanks so much for pinning, Karla. Sorry to have tempted you so much, though … I know how you feel. Reading other people’s blogs often has me drooling, whatever time of day it is! Have a great weekend, Karla! I just LOVE this post so much! I have so many great memories of my grandma buying me angel cake- my favourite cake to enjoy. Love the idea of the skewers and dipping into that delicious chocolate is divine! So happy to have brought back some good memories, Jess! 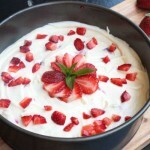 There is something pretty cool about Angel cake, isn’t there? And dipping it in warm chocolate doesn’t hurt, of course! This dessert looks fantastic, Helen! I’m always in the mood for strawberries, even when the weather is below freezing! Sounds like the perfect dessert for a party or get-together! Hi, Gayle! Oh, I’m always in the mood for strawberries and chocolate, too! I’m definitely going to make these again for my next party or get-together! I have been to lots and lots of baby showers and you are indeed, correct, Helen. This has baby shower written all over it! Cute, Very cute. And, congratulations, Auntie. Relish your new role! Hi, Lori … thanks so much for the compliments! I have to admit I was pretty pleased with myself for thinking of this one! And pretty happy when I got to sit down and ‘taste test’ aka stuff my face with quite a few of these! Genius recipe, just genius. I need to hid this from my kids. ** Screech!! ** These are SO FABULOUS Helen!! You rock rock ROCK!! OMG, perfect for a baby shower, EASY to make – I think I have to make them for Australia Day! I have strawberries and wasn’t sure what I was going to use them for – now I know!! They would be absolutely perfectly for Australia day!! Classic and beautiful! My daughter would love this. C’est une bonne idée surtout pour recevoir une bébé au monde! C’est très classe ! 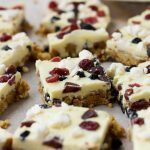 This is such a quick and easy looking dessert Helen! I love strawberries with anything so I would definitely be fan. Hi, Jessica … so glad you like this! It cheered me up on a cold winter’s day, that’s for sure!